Goro Daimon (大門 五郞) is a former gold medalist of Judo and a mentor to his own dojo. He debuted as a member to the Hero Team in The King of Fighters '94, along with Kyo Kusanagi and Benimaru Nikaido. In 1994, he participated in a tournament to determine the fighters who would represent Japan's team for the year's King of Fighters tournament. He loses to Kyo in the preliminary rounds but was chosen as one of the three members for his country. He continues to team with Kyo and Benimaru and becomes friends with them as the years pass. 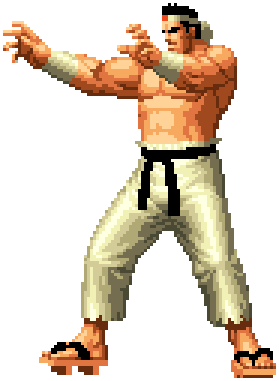 After the climax of The King of Fighters '97, Goro retires from being a fighter and returns to the Judo circuit representing Japan. During his retirement from the tournaments, he married and fathered a son named Daigoro. Daimon always seems to have a very serious expression, and grunts a lot. However, he has a very warm heart, as he always takes his time to co-exist with nature and encounter himself there. He also likes to teach youngsters about Judo in his free time. He also takes his time to serve as an adviser and as a mediator between Kyo and Benimaru. This page was last edited on 18 January 2009, at 15:40.